Minncare Test Strips provide quick results with easytoread indicators. 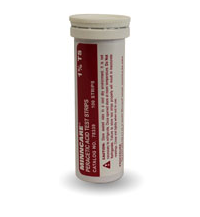 Use the Minncare 1% TS Test Strips as a pass/fail measurement for adequate concentration of sterilant after dilution. Then verify residual levels after rinse-out using Minncare Residual Test Strips. Minncare 1% Test Strips verify adequate concentration of a 1% Minncare solution during sanitization of your high purity water system. These convenient dip-and-read strips can be used at any test port in your system to provide an accurate pass/fail measurement of Minncare solution. 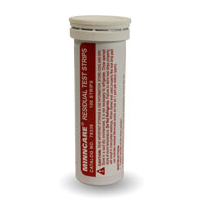 Minncare Residual Test Strips are easy to use and are conveniently packaged 100 test strips per container. Each strip has a “reaction zone” pad located at one end of the strip. When stored and used properly, the test strip pad can indicate residual Minncare levels as low as 1 part per million (ppm). The reaction zones are set to provide six different reading levels at 100, 30, 10, 3, 1 and 0 (zero) parts per million.